But what to try on top to look polished and a bit elegant? If you want yourself an extra posh touch, then you might be interested in these images, as I wanted to collect only the best outfits that will add a dressy touch to your overall look. These bottoms are super hot lately, that's why it's important to know different ways to wear them this year. 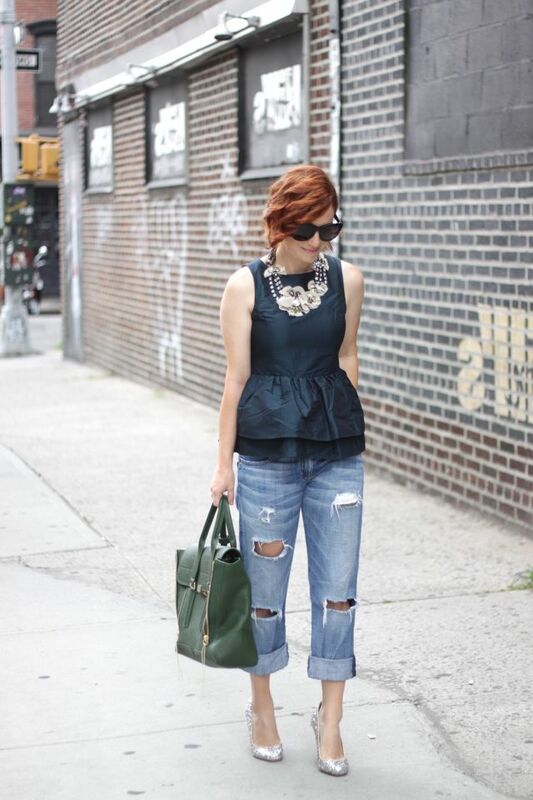 The first idea is to avoid slouchy tops, otherwise you look slobby. Do not overdo a lazy look, otherwise you will look like a homeless wreck. Just imagine yourself wearing those distressed bottoms with a polished look tops, that's a perfect combination. Try on dressy top, like a silk blouse with Peter Pan collar or a printed button up. Love this grunge inspired update. The loose-fit chunky cable knit sweater worn with skinnies. How about cool black leather jacket styled with grey tee and slim-fit skinnies. Love the Wayfarer sunglasses. That's an awesome look that includes a bright blue and white striped pullover worn with extremely ripped slim-fit bottoms. That's an amazing outfit that features a see-through white lace top. 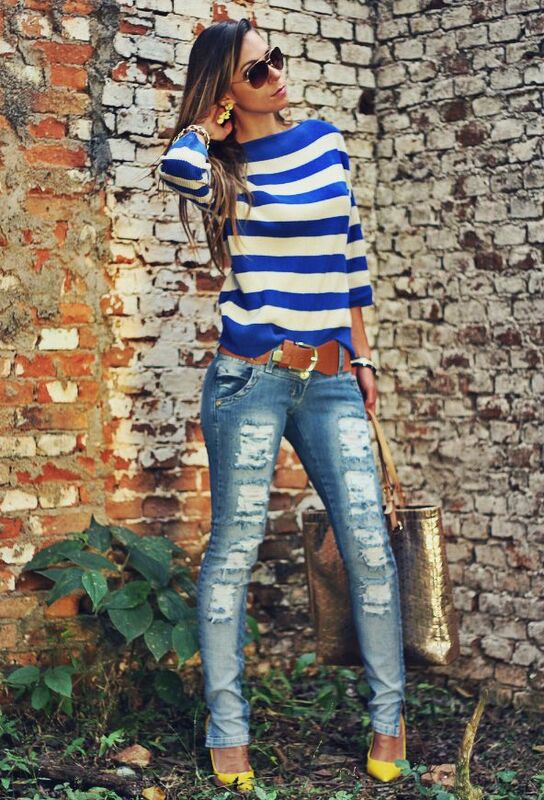 Here we see cool color blocking shirt paired with cool skinnies. I love the mirrored sunglasses, leopard pumps and grommeted handbag. How about wearing white blazer, loose-fit grey tank styled with cuffed, distressed skinnies. You can always go for a blazer that will make you look more smart-casual. I love this professional touch that gives an additional polished style. Speaking of leather, then I guarantee you will always look edgy and cool with a nice biker jacket. Simple plain white tee give a nice everyday look. Love the easy-to-wear touch. Those of you who love Tomboy trend, then I advice to go for something rugged, like a graphic shirt or a cool sweater paired with sneakers or mannish flat formal shoes. Of course it's better to avoid wearing these looks at the office, but I am sure you can try them on in the streets, cocktail parties and night outs in the town. Get inspired by these amazing models, fashionistas and bloggers who were spotted in distressed and cool denim bottoms.